When train approaches Ochanomizu Station either from Akihabara or from Kanda, passengers can see on the right hand side, on the opposite bank of the deep valley of Kanda-gawa River several tiled roofs between thick tree crowns. A tiny green oasis exists in the midst of Tokyo and is surrounded by stone walls in traditional Japanese style. 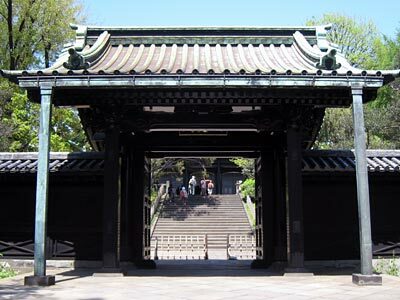 The compound is called "Yushima Seido": Yushima is the place name and Seido means "sacred house" or "temple". The main building is dedicated to Confucius, the founder of Confucianism. Confucianism was the official ideology of the Tokugawa Shogunate and Seido opened here in 1690 and the Confucius temple was transferred from the private estate of the family Hayashi together with its Confucian school. As any other social position, the teaching of Confucianism was practiced hereditarily by a sole scholar family Hayashi all through the Edo Period. Seido was the center of the then official ideology and the school came to be directly administered by the Shogun Government in 1797 and since then "Shoheizaka Gakumonjo" became the stronghold of the official Confucian philosophy and the central institution for the education of samurai youngsters. After 75 years existence, Shoheizaka Gakumonjo came under the administration of the new Meiji Government, which together with two other research institutions of the Shogun Government founded Tokyo University in 1869: Shoheizaka Gakumonjo was renamed as Daigaku and was responsible for Confucianism and Kokugaku (National Study) and two others for the humanities and social science in the Western style and the Western medicine respectively. However, due to the disputes between Confucians and Kokugaku scholars on the one hand and Western scientists on the other hand, the Government decided to close Daigaku in 1884. This appeared to run against the historical trend, because the followers of Kokugaku were promoters of the anti-Shogun movements and they realized the Meiji Restoration. The Meiji Government changed its mind, deserted the Japan-centric philosophy of Kokugaku and surrendered to the model of the West. The site of Daigaku is now separated from the premises of Seido and used by Tokyo Medical and Dental University. Taiseiden - the main building where Confucious is worshiped. Interior of Taiseiden: the statue of Confucius stands in the middle and various offerings are arranged according to the old rules. Ema - people write wishes on the pentagonal tablets. The buildings from the Edo period existed till 1923 when the Great Kanto Earthquake destroyed a vast area of Tokyo. Only Nyutoku-mon survived the Earthquake and the air raids by the American bombers in 1945 and exists till now. The main part of the temple was reconstructed after the Earthquake using reinforced concrete. Seido is since then administered by a corporation whose chairman post is traditionally occupied by heirs of the former Shogun family. The names of reconstructed buildings were partly written by them in noble calligraphy. It seems that the corporation is not rich enough to maintain the site in good shape. The premise is overgrown with weeds, construction materials lie scattered on the ground and certain buildings are not accessible. However, after having seen clean and tidy gardens of the newly developed areas, this carelessness appears natural and relaxing. 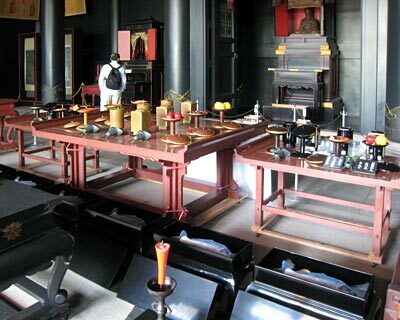 Inside the main temple there stand a statue of Confucius and mortuary tablets of his senior disciples. The custom of worshiping passed ancestors using mortuary tablets is now a part of the Japanese Buddhism. But, it has its origin in the Confucian rituals for ancestor worship. 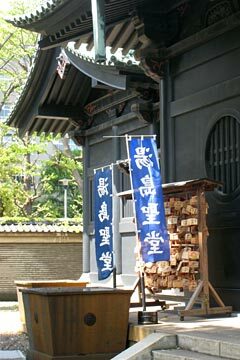 Ancestor worship is a common religious practice in Far East and Confucianism highly stylized it. However, except for such elements as are naturalized in the daily life, Chinese utensils used for Confucian rituals look very exotic for me. A large Confucius statue in the garden was donated by the Lions Club of Taipei. The whole area looks very exotic to me, though my father and grand father generations might see it more familiar to them than I feel it. Chinese civilization was a part of the Japanese intellectual heritage. But, we largely lost such a tradition after WWII. 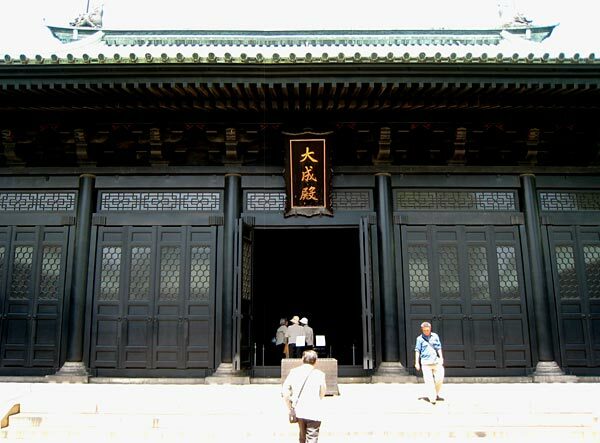 Anyhow, Confucianism is the authorized study in Japan for centuries and it is very natural that present students also pray here for good luck in examinations. Depositing pentagon shaped wooden tablets with wishes on them is a very Japanese habit, a good fusion of Chinese philosophy and Japanese superstition. 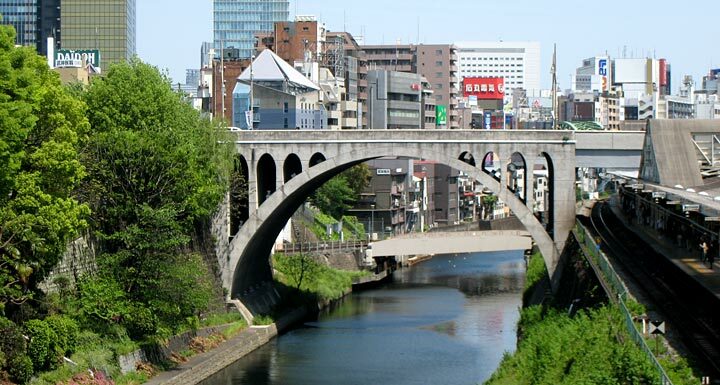 Hijiri-bashi was constructed after the Great Kanto Earthquake in 1923. Seido exist on the left bank of the Kanda river. Behind the bridge, a bridge of Marunouchi subway line is seen. The platform of Ochanomizu Station is seen on the right. In the background the Akihabara area is seen. The bridge between the two banks of Kanda-gawa River is called "Hijiri-bashi" and this literally means "sacred bridge" whereby the same Chinese character can be read in Japanese in two ways "hijiri" and "sei". I had thought for decades that this "sacred" only relates to Seido, but discovered this day that it was named because it bridged two Seidos: Yushima Seido and Nicolai-do. Nicolai-do is officially called in English "Holy Resurrection Cathedral". 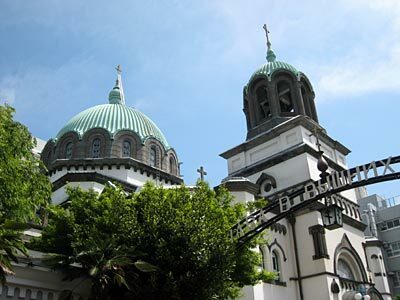 It is the main Orthodox Church in Japan and the largest building in Japan constructed in Byzantine style. The word cathedral was translated as "dai-seido", literally "large sacred house". Only difference is the addition of "large" for cathedral. It was indeed large on a hill top and could be seen even from the imperial Palace till the 1960s when large buildings started to surround Nicolai-co. It is funny that Hijiri-bashi connects two holy houses, Chinese and Russian. This symbolizes the importance of those two countries to the Japanese civilization and society.